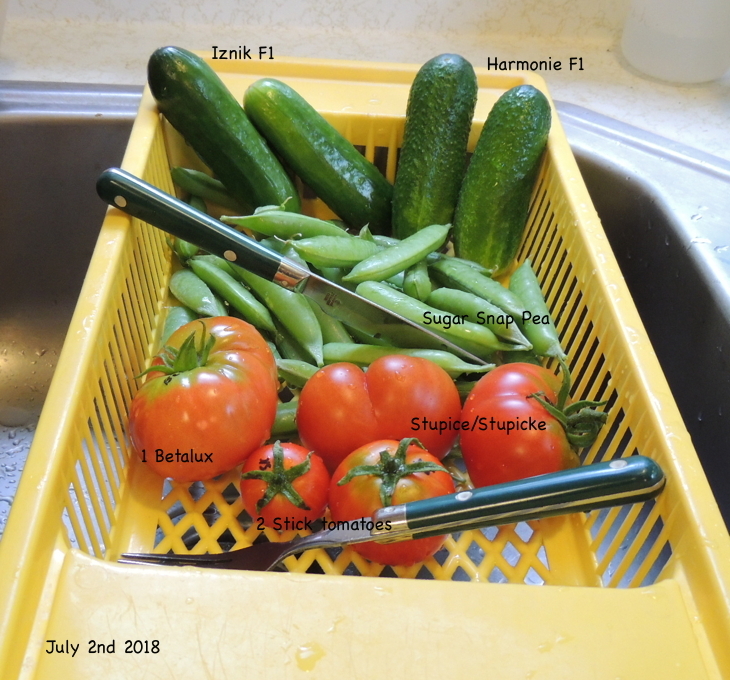 Tomatoville® Gardening Forums Index > We're Here For The Tomatoes!™ > General Discussion > Stupice sent from Prague with three other varieties? Stupice sent from Prague with three other varieties? I really like the earliness of Stupice and grow it every year. I was researching it's background for a friend and came upon this from the Victory Seeds site. I am a permanent reader of 'The Organic Gardening and Farming' and the January issue I have read a very interesting article: 'Special seeds for special needs' and your successful undertaking. I beg to ask you for your catalog and some trial seeds esp. of your tomatoes, onions, lettuce, Marigold and Verbena for now. In the contrary I am enclosing four varieties of our Czechoslovak tomatoes and two East German bush varieties which proved here very well. And one Bulgarian variety too. I am 70 and in spite of this I am most happy when I can try something new in my garden. Please to write me if you have some wish I could accomplish. I thank you in advance! Do any of you wise TV people know what were the other three varieties he sent? Have they flourished and become well known varieties here as well? Just wondering.. it's a great story. Sodomka was the messenger spreading the seeds around but he was not the one who bred them. There was a very long discussion about this at the original Garden web,and several folks tried to reach the site where they were bred and by whom,with no luck. Thanks Danish and Carolyn for your links. I am still researching. There is nothing to explore. Milan Sodomka bought in the shop the seeds of four commercial Czechoslovak tomato varieties and sent them in original bags to the USA. Thanks Vladimir. It is always good to have the CZ clarity you provide. Yes- thank you Vladimir for that info. From the other three varieties, do you grow any or particularly like any of them? I cultivated all three varieties. The problem is that the seeds of these varieties can no longer be reached in the Czech Republic so I had to buy them in the USA. I checked the authenticity of the variety as described by the Czech Gene Bank. Czech bush and Olmovic I grew in 2015 and writing about it in a thread http://www.tomatoville.com/showthrea...rBig46&page=13. This year I do not grow bush tomatoes outside those in the hotbed where I also tried Urbikany last year. Unfortunately, plants from the US and UK seeds were not determinant. Thanks for your time and follow up Vladimir. So it looks like the real continuing winner from that original seed share was Stupice. I will share that info with my friend when I give her the young plant I grew for her. This is a view of Stupice as shown on Saturday, May 12, 2018, in Austin, Texas. We harvested our first fruit last week. These were picked yesterday. Seeds are now being fermented, to be dried and saved. Very tasty for a small-early variety. Wow! Tomatoes in May!!! Here in PEI we can't even plant out until June 11th and unfortunately this year on June 15th there was a frost! Nice to see a beautiful Stupice! One of my favorites for sure. Now I am wishing I had planted one this year, lol! Iron Pete, I have never missed a year without Stupice since I got my original seeds from my first TGS seed catalog. I don't even know how long it's been - 15+ ??? years. I keep trying other earlies, but my saved Stupice seeds always beat out everything else. Vladimir shared some recently produced Czech Stupice/Stupicke seeds with me and the Stupicke Moravo was ripe the same day as my U.S. one. The Stick tomatoes are kind of a cheat because they were started in February as part of a germination test. The Bétalux started blushing about the same time as Stupice, but took longer to get to eating stage. I started my seeds the last week of March, and they went into the garden the last week of May. Picked off the vine on July 2nd, but I could have taken them in the last few days of June. I don't think I've have an in-ground tomato ripe before the 2nd week of July before. I think my seeds came from TGS too, lol! Great taste for me. Nice picture. Last edited by IronPete; July 11, 2018 at 04:30 PM. Reason: I get confused.. thought my font was extra small.